Gaining weight requires eating more calories than your body needs each day, so the extra energy helps you add bulk to your frame. But if you're already very active and trying to gain weight, it can be hard to get all the calories you need from solid food without feeling too full. Smoothies offer a solution; you can customize your smoothie to pack in lots of calories for weight gain, but, as a source of liquid calories, smoothies may not make you feel as full as solid food. No matter how you decide to structure your diet, you'll need to create a caloric surplus to gain weight, which means eating more calories each day than you burn to make your body use the excess energy to grow new muscle tissue and gain fat. Slow weight gain is best; the McKinley Health Center recommends an extra 250 to 500 calories each day, which corresponds to a weight gain of roughly 0.5 to 1 pound weekly. Use an online calculator or meet with a nutrition professional to figure out your daily calorie needs; then add the extra calories needed for the calorie surplus to calculate your daily calorie intake goal. Simply adding a fruit smoothie to your daily routine -- without drinking it in place of your regular meals -- might be enough to get you the additional calories you need. You can use any kind of fruit in your smoothies, but you may want to go for higher-calorie fruit, such as bananas, mangoes and pineapple. Fruit itself is typically low in protein; for example, a cup of pineapple chunks has just a gram of protein, so you should mix protein-rich ingredients into your fruit smoothies for healthy weight gain. You need protein paired with a strength training exercise routine to build new muscle, so making a protein-packed fruit smoothie helps you gain lean mass. If you strength train, you'll need roughly 0.8 grams of protein in your diet for each pound of body weight; that's 108 grams if you weigh 135 pounds, or 128 grams of you weigh 160 pounds. Using milk or soymilk in your fruit smoothies provides 9 and 7 grams of protein per cup, respectively, while Greek yogurt supplies 17 grams per 6-ounce container. The fruit in your smoothie adds a modest amount of protein -- a large banana or a cup of mango chunks each add 1.5 grams. Powdered milk or a protein powder, such as whey, casein, soy or other protein blends, can also boost your protein and calorie intake. The exact amount you'll get depends on the variety you choose, so check the nutrition label. Fat is a concentrated source of calories -- it has more than twice the calories, per gram, than protein or carbohydrates -- so healthy fats are a must in weight gain fruit smoothies. Try adding peanut butter to your smoothie -- a 2-tablespoon serving supplies 188 calories, which includes 8 grams of protein and 16 grams of unsaturated fat. Almond butter offers similar weight gain benefits -- 2 tablespoons has 196 calories, 7 grams of protein and 18 grams of fat(ref5). If you're allergic to nuts -- or just aren't a fan of their taste -- try using coconut or flaxseed to up your smoothie's fat content. A teaspoon of coconut oil adds 43 calories -- all of which come from its 5 grams of fat -- while an ounce of unsweetened dried coconut meat, such as shredded coconut, adds 185 calories, 18 grams of fat and 2 grams of protein. Ground flaxseeds supply 37 calories per tablespoon and offer 1 gram of protein and 3 grams of fat, including heart-healthy omega-3 fatty acids. It's easy to get the extra 250 to 500 calories you need daily just by adding a fruit smoothie in addition to your regular meals. Blend a cup of unsweetened soymilk with a large banana and half a 6-ounce container of Greek yogurt for a simple smoothie that has around 250 calories, along with 17 grams of protein. Or try a fruit smoothie made from a cup of nonfat milk, a cup of mango chunks and a tablespoon of almond butter for a beverage that supplies approximately 290 calories. For a higher-calorie smoothie, up your serving size and add more calorie-rich ingredients. 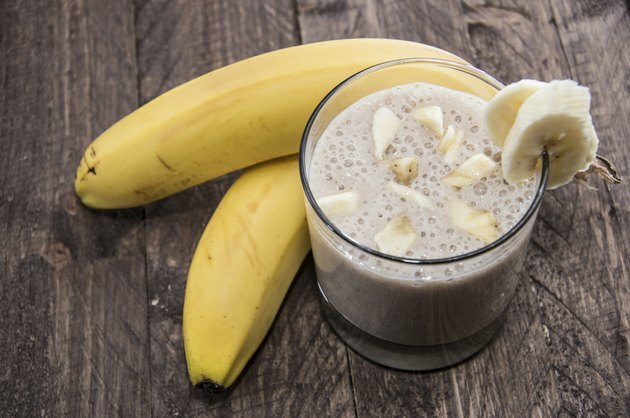 Try a smoothie made from a cup of nonfat milk, a large banana and a cup of pineapple chunks, plus a container of Greek yogurt, to get 395 calories and 29 grams of protein. Or blend a cup of unsweetened soy milk with a cup of mango chunks, half a frozen banana, a serving of whey protein and a tablespoon of peanut butter -- or half an ounce of shredded coconut -- for a smoothie that contains almost 500 calories and 36 to 39 grams of protein, depending on whether you used lower-protein coconut or higher-protein peanut butter. While your calorie surplus ensures you'll gain weight, you need an exercise and strength training program to make sure some of those gains come from lean muscle tissue instead of fat. To do that, strength train 2 to 3 times weekly on non-consecutive days, and choose 1 to 3 exercises for each of the major muscle groups: arms, shoulders, back, chest, abs, glutes and legs. Gain muscle by doing four to eight reps of each exercise, using a weight that feels challenging. Exactly how you structure your program, the exercises you choose and how much weight to lift depends on your current strength, flexibility, balance and overall fitness levels. Consult a fitness professional for a program that's challenging, but safe and effective for weight gain.